Hey ya'll! Hope you all had a fabulous week! I thought I would do an early Friday Freebie! As you know I'm a HUGE fan of the Bucket Filler program. I created a certificate that I've been using with my firsties and they LOVE IT!! It's typical for me to stop in the middle of a lesson and just announce an outstanding bucket filler or two. The looks on their faces is so precious!! Click on the picture for the free link. Enjoy! 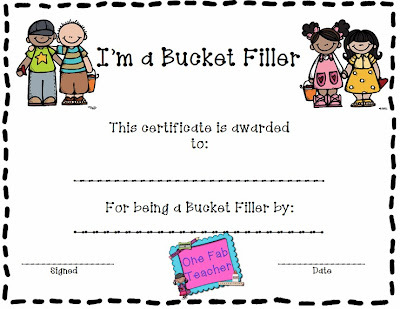 I like the Bucket Filler certificate :) Thanks for sharing! I am a new follower! Thank you so much Annie!! I'm your newest follower as well.